The controversial blog TCIpost.com disappeared without warning and we at Barbados Free Press suspect that the UK Government or SIR David Simmons or a combination of powers have something to do with that. 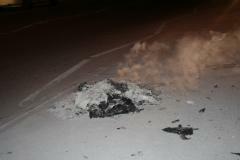 Of course, the fact that Turks and Caicos citizens are burning copies of the “new” Constitution imposed by the UK (photo above) might have something to do with the UK’s trying to kill all talk of the TCI independence movement. We’ve asked our readers to send us any TCIpost stories that they copied to add to those we have some ourselves. We’re going to republish them all here because it’s all about freedom of the press. Hey… we’re happy to be of assistance! Here is the first story. We haven’t a clue about when it was first published at TCIpost and if someone could let us know we’ll include a dateline. As Caricom leaders gear up this week to discuss the new constitution being imposed by the British on the Turks and Caicos citizens, the people are overwhelmingly vehement that they wish to preserve their rights under their own constitution. This week Caricom will be meeting to discuss how they should collectively respond to the UK in regard to this new constitution. Controversial Turks and Caicos blog disappears. Did the UK government get to TCI Post? 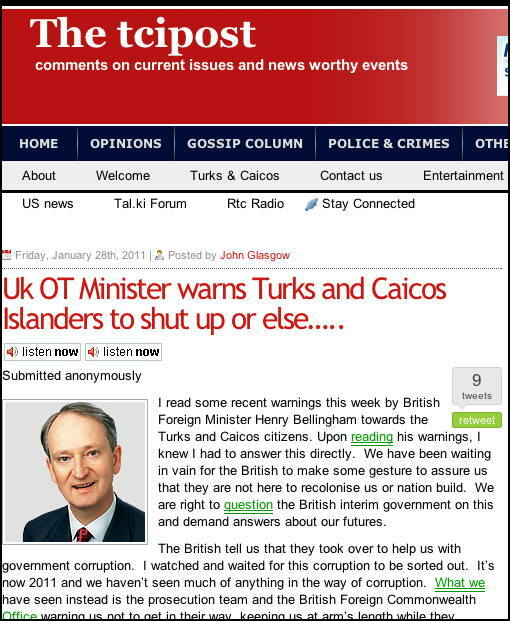 A hard hitting blog calling for Turks and Caicos independence disappeared overnight without notice. Visitors to TCIpost.com are now met with an administrative page for Trendy Site Builder. Police demanded victim change his official statement to match another witness statement! On 02/09/2011 while fishing at Archers Bay, St. Lucy, Barbados around 7 to 7:15 PM my Bajan friend and I (a US citizen) were the victims of a robbery, and our lives threatened by a Bajan man with a machete. He also told us he would shoot us if we did not do what he said. We did as he said. He got a cell phone and cash. This is not the first time this man has robbed someone, he knew what he was doing.